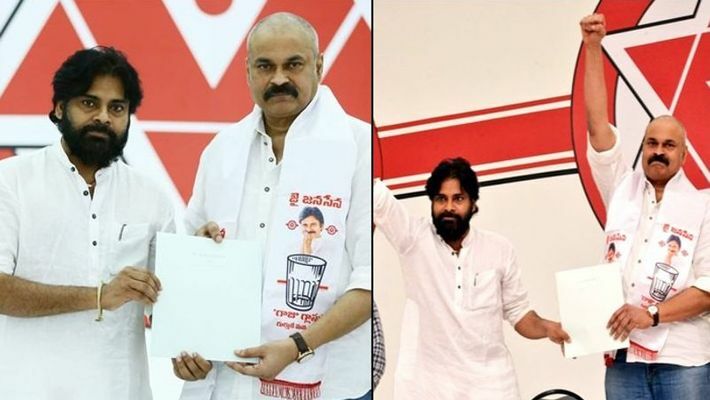 Amaravati: Chiranjeevi's brother Nagababu aka Nagendra Babu has joined Power Star Pawan Kalyan's Jana Sena Party (JSP) and will contest from Narasapuram constituency in Andhra Pradesh. We all know how actor-turned-politician Pawan Kalyan has single-handedly brought the Jana Sena Party to power in the state and how he is all set to contest the Andhra Pradesh election as well as the Lok Sabha election in 2019. Actor Nagababu joined JanaSena Party. Since last few weeks, Pawan Kalyan has been touring Andhra Pradesh and promoting his party. He received a lot of criticisms with respect to his political journey. Now, support from one of the most powerful families of Andhra Pradesh comes to Kalyan in the form of Nagababu. Recently, Pawan Kalyan has decided to field Nagababu as a candidate for the Narasapuram constituency. Suresh Kondi, a publicist of Telugu films, tweeted a photo and wrote, "Actor #Nagababu joins #JanaSena in the presence of #PawanKalyan. He will contest for #Narasapuram MP. #JanasenaParty #Elections2019." Supporters of Jana Sena Party and Pawan Kalyan are happy with Nagababu's decision and his presence will make a huge difference for the party, they said. Can you guess what Chiranjeevi, Venkatesh are hiding in this photograph with Sridevi?